The push by California billionaire Tom Steyer to impeach President Trump is shifting gears, moving some of the focus away from pressuring members of the House of Representatives, and is now hoping to gain commitments to impeachment from every Democrat running for president. "Steyer and his staff plan to spread out over the country and on TV, canvassing nationwide and showing up at presidential campaign events, while intensifying online outreach to his list of 7 million supporters, the largest independent political operation in the country," a report by the Atlantic noted. "If you're against impeachment, don't bother running," Steyer told the magazine. "Save your time. Drive an Uber." 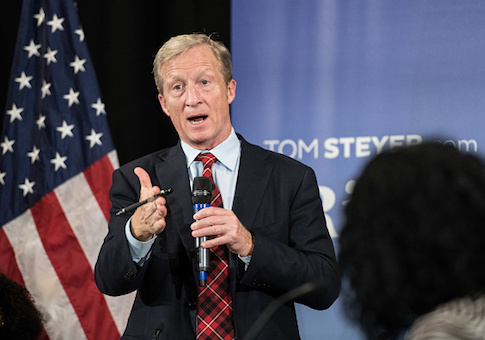 News of the shift comes on the same day that Steyer's Need to Impeach PAC issued a press release announcing a two-day impeachment "summit" scheduled for next week in Washington, D.C. The press release makes clear that the idea of pressuring congressional members has not been completely abandoned. The summit will "provide about 300 participants with the tools they need to pressure their representatives to remove Donald Trump from power." Two weeks ago, Steyer announced from Iowa he would not be running for president and instead revealed he'd be pumping in another $40 million to his Need to Impeach campaign. "Now, the impeachment question has reached an inflection point," Steyer said at the time from a downtown Des Moines hotel. "Therefore, I will be dedicating 100 percent of my time, effort, and resources to one cause: working for Mr. Trump's impeachment and removal from office." Democratic presidential candidate Joaquin Castro jumped on the impeachment issue last week after a report from Buzzfeed claimed President Trump had directed his attorney Michael Cohen to lie to congressional investigators about matters related to a possible Trump project in Moscow. The credibility of that report was undermined by a subsequent statement from Special Counsel Robert Mueller's office saying the report was "not accurate." Other contenders such as California senator Kamala Harris and Massachusetts senator Elizabeth Warren have not focused on the impeachment issue. In the first iteration of the Need to Impeach campaign, Steyer's focus seemed almost exclusively on House members, and mainly Democrats, at a time when they were still in the minority. Returning control of the House to Democrats was a major focus for Steyer through 2018, as he donated north of $100 million to political candidates and causes that cycle. However, Steyer and his team repeatedly said impeachment was not a "litmus test" for which candidates he would support with his money and his PACs. With the midterms now concluded, political and media attention has begun to shift, and so has Steyer. "If you're not willing to deal with the crisis in America, which is Donald Trump, then really, why should you be president?" he was quoted as saying by the Atlantic. At the same time, the strategy of pressuring Democratic House members is also undergoing a tactical shift. The scope of that part of the campaign will be narrowed to fewer than a dozen members, and will focus on members with key committee positions, like House Intelligence Committee Chairman Adam Schiff and House Judiciary Chairman Jerry Nadler. This entry was posted in Politics and tagged 2020 Election, Tom Steyer. Bookmark the permalink.